jointly sponsored by the Departments of East Asian Languages and Civilizations and Near Eastern Languages and Civilizations. 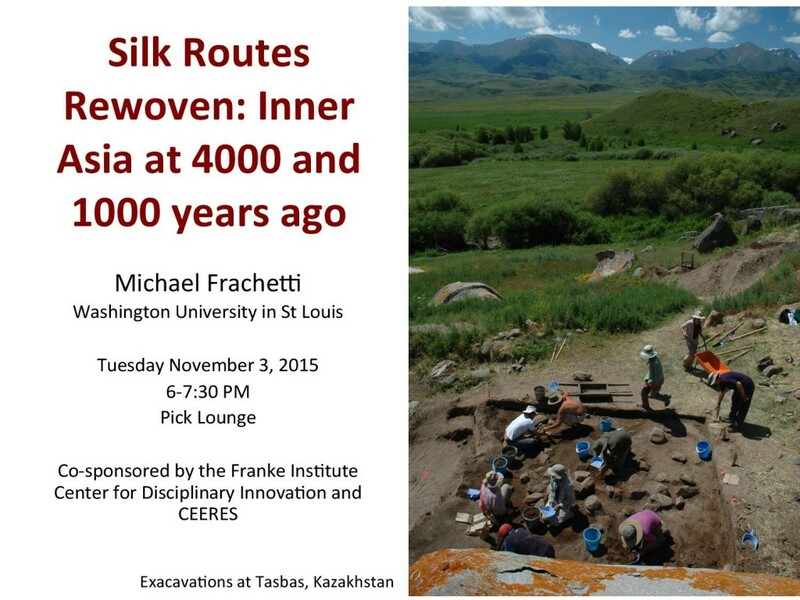 This lecture presents two parallel snapshots of “Silk Road” interaction. The first snapshot comes from Bronze Age archaeological investigations in Southeastern Kazakhstan (ca. 2500 cal BCE), which reveal the earliest known evidence for interaction networks between East Asia and SW Asia. Such networks are attested in the form of early domesticated grains, which trace the introduction of wheat and barley to China as well as millet into Central and SW Asia. The second snapshot explores the Silk Routes during the height of their use in the Medieval era and examines the formation of complex political and economic landscapes in Southeastern Uzbekistan. As both cases are drawn from “nomadic” contexts, they require us to reevaluate the models for social complexity and institutional organization that shape both common and academic ideas about the world’s most extensive ancient overland trade network. This course draws on archaeological and historical approaches to examine pastoral nomadism in the ancient Near East. Historians and archaeologists increasingly acknowledge the central role pastoralists and nomads played in the development of cities, states, and empires, as well as the dynamism and complexities of transhumant societies that traditionally figured only marginally in their accounts. The course re-centers the historical perspective through a focus on mobile groups in the geographical and cultural interstices of traditional civilizational “centers.” It insists on the interdependence of historical and archaeological forms of analysis to the recovery of pastoral nomadic societies, economies, and political cultures. 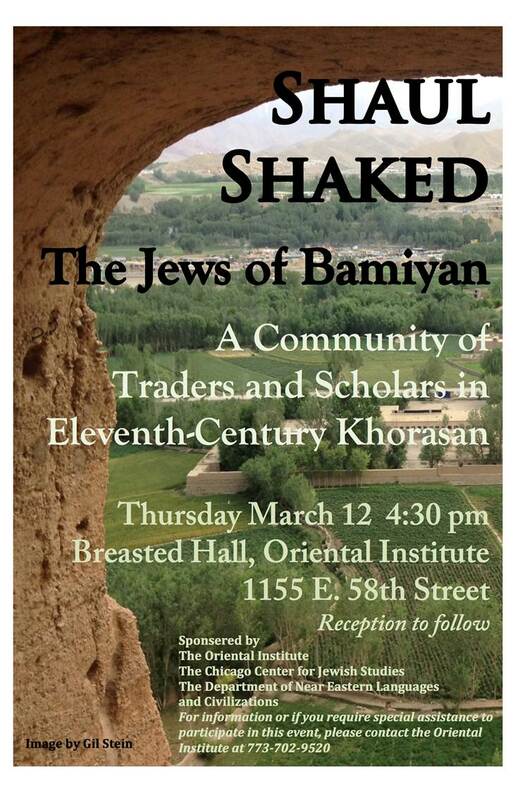 The comparative invisibility of nomads and pastoralists in literary and material cultures poses interpretive problems that the seminar seeks to address. On the one hand, archaeologists have innovated a range of approaches to document the activities of mobile groups that often avoided the very nucleation once considered a defining feature of civilization. On the other hand, historians have begun to transcend the sedentary civilizational perspective of their sources to place texts in conversation with material culture. Our aim is to bring together these methods to produce accounts of nomadic civilizations that are simultaneously archaeological and historical. We will also explore the tensions between interpretations drawn from historical accounts and ideas generated via ethnographic analogies. The seminar will discuss recent work emphasizing the economic, social, and political complexity of mobile pastoral groups, and the diversity of nomadic pastoral practices and nomad-sedentary relations in the past, while inviting the students to produce issue-oriented papers on various debates in the field. The Department of East Asian Languages and Literatures and the Humanities Program seek to make the joint tenure-track appointment of an assistant professor, to begin July 2016. The appointee will teach undergraduate and graduate courses in EALL and also undergraduate courses suited for the interdisciplinary Humanities Program. We seek a scholar of outstanding promise who engages intensively with Chinese, Japanese, Korean, or Inner Asian primary materials. Since this is a fully joint appointment, the successful applicant will demonstrate abilities and research interests in both the East Asian and broader humanistic contexts as well as a commitment to interdisciplinary dialogue with other departments and programs. The period, field, and specialization are open. UChicago Uzbek in the NYT! CMES alumna Lydia Kiesling has written a glowing Letter of Recommendation for the Uzbek language, which she studied right here at the University of Chicago. Take a look at this defense of “less commonly taught languages,” and consider registering for the many Central Asian languages which we continue to offer here, including Uzbek! Take a look at CCES members’ exciting new course offerings for Autumn 2015! In addition to our rich selection of languages (Armenian, Kazakh, or Uzbek, anyone? ), we will again be sponsoring an introductory course in Central Eurasian History. Updates will be added as we receive them! This year at the 30th Annual Middle East History and Theory Conference, there are two events directly related to Central Eurasia. Second, the Committee on Central Eurasian Studies is sponsoring a Happy Hour, 5:00 PM on May 2, 2015, at Ida Noyes Hall. We look forward to seeing both new and familiar faces at these exciting events! 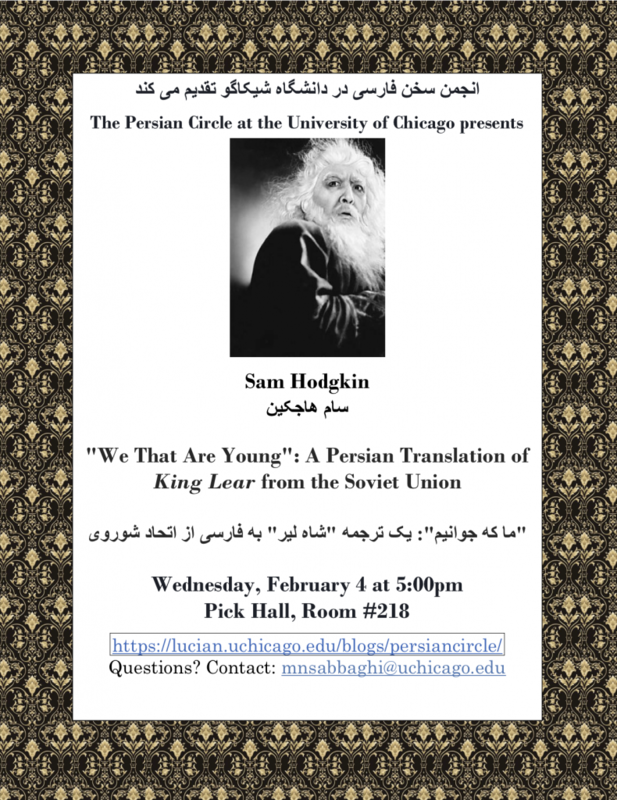 Sam Hodgkin, an active CCES member, is a doctoral student in Near Eastern Languages and Civilizations at the University of Chicago. His research focuses on the role of the Soviet Union in the making of modern Persianate literature, and vice versa. In his work, he follows Central Asian, Iranian, and Turkish writers and artworks as they wander around twentieth-century Eurasia.